These super-absorbent, quick-drying, and suede-like yoga towels are as beautiful as they are functional. Arete absorbs eight times its weight in water and works as a slip-resistant layer for your mat. Use one to dry off after a workout or to keep your grip during downward dog. Or just enjoy the calm, soothing hues that look more sophisticated than your average workout gear. Dimensions: 26" x 72" x 0.10"
Not only are Arete hand towels and yoga towels high performance—it’s evident they’re the brainchild of an artist. 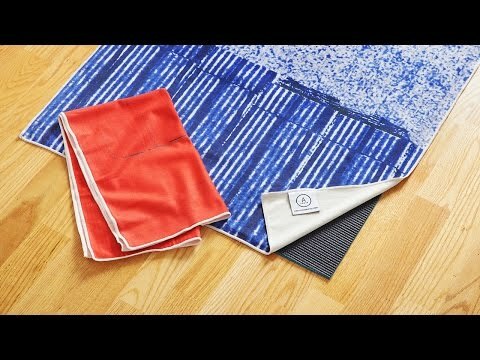 These hand towels and non-slip yoga mat covers absorb up to eight times their weight in water. They don’t feel like your regular cotton towel. The super soft, suede-like fiber feels great and dries quickly. Maker Paul Moston’s soothing color palette counteracts the harsher, more abrasive tones used in regular sports gear. Paul combined two of his passions to create Arete: a love for tennis and yoga and his art history degree. He exercised his creative muscles to design subtle textures and hues to be laser-printed on the poly/nylon fabric. This resulted in a Grommet that’s equal parts functional and sophisticated. Whether you get a glimpse of the beautiful patterns during your downward dog or at the end of long bike ride, these towels add a touch of calm to your workout.